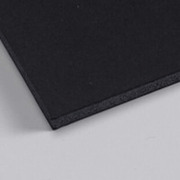 Black matte paper surface on both sides and black core middle.The foamcore is non memory, which means the edges will stay pinched when cut. This is useful in die cutting as well as embossing...also useful in picture frame backing, where a pinched edge can supply a snug fit in the frame. 30 points will be rewarded when you are logged in to your account and buy this item.